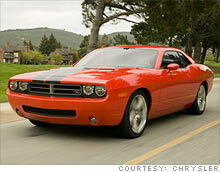 Chrysler Group muscle car takes top spot in Consumer Reports survey. Kelley Blue Book predicts that these models will hold their value better than others in their classes. NEW YORK (CNNMoney.com) -- The Dodge Challenger, the Chrysler Group's retro-styled muscle car, is the car best loved by its owners, according to Consumer Reports' survey of 380,000 readers of its magazine and Web site. "Ninety-two percent of Challenger owners said they would definitely buy another one given the same opportunity," reads an article in the influential magazine's January issue. The Ford Fusion Hybrid ranked second in the magazine's "Predicted Owner Satisfaction" survey, with 91% of owners saying they would buy another. The Prius dropped to fifth place in the survey this year, behind the Chevrolet Corvette and Porsche 911. The survey -- which asks car owners "considering all factors (price, performance, reliability, comfort, enjoyment, etc. ), would you get this car if you had it to do all over again?" -- tends to favor vehicles that people purchase for design, driving performance, or other emotional reasons rather than to simply fill practical needs. Recently introduced or redesigned models also tend to do better in the annual survey. The Challenger, a car designed to evoke memories of Chrysler Group's classic Dodge and Plymouth muscle cars of the late 1960s and early '70s, went into production in late 2008. "We at Dodge are thrilled the Dodge Challenger owners love their ride so much that they would definitely buy another one," said Ralph Gilles, president and chief executive of Chrysler Group's Dodge brand. The opinions of its readers notwithstanding, Consumer Reports itself does not recommend the Challenger. While the car's reliability is about average, according to Consumer Reports' surveys, the Challenger fared poorly in the magazine's performance tests. While Consumer Reports car testers lauded the Challenger's acceleration and engine sound, the car received criticism for its handling, braking, visibility and fuel economy. The Challenger received an overall rating of 53 out of a possible 100, which is close to the lowest score in Consumer Reports' "Sporty Car" category. The highest score in the category, a 97, was received by the BMW 135i, a car the magazine doesn't recommend because of poor predicted reliability. The Chevrolet Camaro and the redesigned 2010 Ford Mustang, the two cars that compete most directly against the Challenger, were both too new to be included in the owner satisfaction survey, which requires that a car be on the market for at least a year. John Linkov, Consumer Reports managing editor for autos, said he saw no conflict between the magazine's low rating and consumers' opinions of their own cars. The magazine's testing doesn't take into account factors like design that can greatly influence customers' vehicle choices. The purpose of the magazine's testing is to provide a baseline for comparing vehicles, he said, and car buyers need to reach their own decisions. Linkov recommends that car shoppers consider multiple vehicles before buying one, and factor in the results of their own test drives. "Make your choices totally informed, and if, at the end of the the day, it adds up to something else for you, that's fine," he said.